Purchase online MAX30105 Particle Sensor 5V Module in India at low price from DNA Technology, Nashik. The MAX30105 is an integrated particle-sensing module. It includes internal LEDs, photodetectors, optical elements, and low-noise electronics with ambient light rejection. The MAX30105 provides a complete system solution to ease the design-in process of smoke detection applications including fire alarms. Due to its extremely small size, the MAX30105 can also be used as a smoke detection sen- sor for mobile and wearable devices. The MAX30105 operates on a single 1.8V power supply and a separate 5.0V power supply for the internal LEDs. 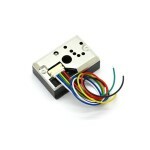 It communicates through a standard I 2 C-compatible inter- face. The module can be shut down through software with zero standby current, allowing the power rails to remain powered at all times. Related Video: MAX30105 Particle Sensor Breakout. GP2Y1010AU0F Optical Dust SensorGP2Y1010AU0F Module is used to Sense Dust Particles in air and also ..